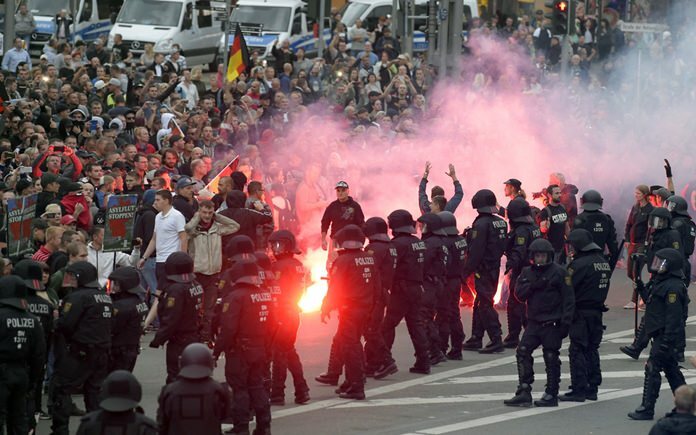 Chemnitz, Germany (AP) — Hundreds of police officers worked to keep right-wing and left-wing demonstrators apart Monday night in a city in eastern Germany where an Iraqi and a Syrian citizen were arrested in the killing of a German man. Officers in riot gear pushed people back as they tried to get at those on the other side. The demonstrators from the right hurled bottles and firecrackers at the rival camp before starting off on a march through Chemnitz. The police said the leftist protesters responded in kind. The city’s police department reported on Twitter that several people were treated for injuries, but gave no details. Both groups took to the streets of Chemnitz after a 35-year-old German man was injured during a clash after a street festival and died early Sunday. Prosecutor Christine Muecke told reporters Monday the slaying stemmed from a verbal confrontation that escalated. Two men were taken into custody — a 22-year-old Syrian citizen and a 21 year-old Iraqi citizen— and both were held on suspicion of manslaughter, Muecke said. She refused to provide more details about the suspects or the victim. Hundreds of people also took part in spontaneous protests late Sunday in Chemnitz, a city where almost a quarter of the voters supported the far-right Alternative for Germany party last year. Videos posted on social media appeared to show far-right protesters threatening and chasing passers-by. “It must never again be accepted in Germany that people are attacked because of their statements or their background,” council President Josef Schuster said in a statement. Of the estimated 800 people who took part in the first round of protests, about 50 were involved in violence and attacked police officers with bottles and stones, Chemnitz Police Chief Sonja Penzel said. A Syrian teenager and an Afghan teenager were attacked in separate incidents but were not seriously hurt and a 30-year-old Bulgarian was also threatened, she said. Penzel said police are still evaluating video footage and called for any witnesses to the violence to come forward. Ahead of the Monday night protests, authorities vowed not to let the situation get out of hand. City police had water cannons on hand. “We will not abandon the streets to violent offenders and those spreading chaos,” Saxony state Interior Minister Roland Woeller said. Earlier in the day, Chancellor Angela Merkel’s spokesman, Steffen Seibert, strongly condemned Sunday’s violence. “What was seen yesterday in parts of Chemnitz and what was recorded on video has no place in our country,” Seibert told reporters in Berlin. Seibert also criticized a far-right lawmaker who suggested that German authorities were unable to protect citizens. “There is no place in Germany for vigilantism, for groups that want to spread hatred on the streets, for intolerance and racism,” Seibert said.